Dryers never give us a heads-up when they are about to stop working. They don’t have warning lights telling you that the motor is 5 minutes away from burning out. Like most appliances, they simply wait until you try to use them, and then they just don’t work. You can't wait around until next week for Sears or some national company to show. or to find out that the company you hired forgot to order the parts you needed. We understand you need dryer repaired, you need it right away, and most importantly you need it done right! Call us Today at 303-828-6111 or use the contact form below. 2. Wash the lint filter once a month with warm soapy water. Dryer sheets, fabric softener and detergent will fill up the holes on the screen decreasing it's efficiency. 3. Make sure the dryer vent hose is not kinked, smashed, or excessively long. 4. Use the automatic cycle to save energy. Weather gas or electric running the dryer more than necessary will add to increased energy bills. 5. Have your dryer vent professionally cleaned annually. This will ensure maximum efficiency. More importantly it will run safely. Read more about dryer safety below. According to the U.S. Consumer Product Safety Commission, there are an estimated annual 15,500 fires, 10 deaths and 310 injuries due to clothes dryer fires. Having THE INTERIOR your dryer cleaned is just as important as having the vent cleaned. 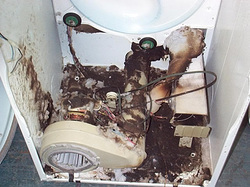 The photo above is of an actual dryer fire that happened. Dryer lint is very flammable. The actual place the fire starts is inside your dryer and then travels into the walls of your home. Dryer vent cleaning services typically only clean the vent of your home. Goodmans Appliance Repair offers the service of taking your dryer apart and cleaning the interior of your dryer and inspect all moving parts. Contact Us today about this important service. Please see this YouTube Video about the dangers of dryer fires.